I absolutely love seafood. Whether it is fresh fish, crab, oysters, or shrimp, if it’s on the menu, a vast majority of the time I’ll be ordering it. One can understand my concern then, following the 2010 explosion aboard the Deepwater Horizon (the BP oil rig that was located off the coast of Louisiana), when reports first indicated that oil may have been leaking from the damaged drill site. Of course initially my concern went to the families of the eleven victims who had lost their lives working aboard the rig. However, the alarmingly large amount of oil that was gushing from the drill site brought about other worries that would occupy my attention over the following months. One of which was how badly the seafood industry would be affected by an environmental catastrophe of such great magnitude. 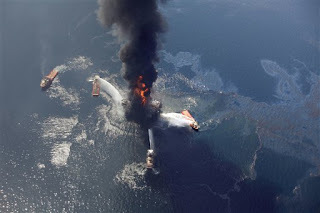 Media coverage of the spill ranged from the explosion itself, to drama regarding BP and its negligence, to the various environmental clean-up efforts that were going on. Needless to say, the oil spill received the undivided attention of the media. The nation watched for approximately ninety-six days as toxic oil spewed uncontrollably from the damaged well. Current official reports from the government estimate that the well leaked oil at approximately 2.6 million gallons per day and in total approximately 210 million gallons of oil ended up making its way into the waters of the Gulf of Mexico. In addition to the oil, BP administered roughly 1.8 million gallons of chemical dispersants, the vast majority of which being COREXIT 9500, in hopes of dispersing the crude oil throughout the water column before it could make landfall along the ecologically sensitive coastline. To better imagine the amount of pollutants introduced into the gulf, an Olympic sized swimming pool can hold approximately 650,000 gallons, thus, the amount of pollutants would fill approximately 325 Olympic sized swimming pools to the brim. Like most people who casually watch the news the “out of sight, out of mind” tendency hit me and after media coverage of the oil spill stopped, I also stopped worrying about the gulf. In the two years since the oil spill happened, I’m ashamed to say that I haven’t thought much about it until this past month. A few weeks ago however, a friend shared an article with me that was posted on Aljazeera that I found quite disturbing. According to investigative journalist Dahr Jamail at Aljazeera, there have been numerous reports of deformities and illness in various species of shellfish and fish. Such deformities include, according to a local crab commercial fisherman Tracy Kuhns, “eyeless crabs, crabs with their shells soft instead of hard, full grown crabs that are one-fifth their normal size, clawless crabs, and crabs with shells that don't have their usual spikes … they look like they've been burned off by chemicals”. 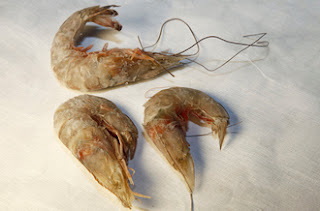 Along with Tracy Kuhns’ story, there are various other recorded accounts and pictures of deformities found on seafood, one of the most disturbing involving shrimp. Hundreds of pounds of shrimp are being caught that are not only missing eyes, but also are missing their entire eye sockets as well. This observation suggest either a genetic mutation has occurred that has altered the shrimps genome, or something in the water is preventing the normal development of the species eyes. Many believe that it is either the oil, the chemical dispersant deployed by BP, or both that are at fault. According to a fourth generation fisherman of the Mississippi coast, Sidney Schwartz, “We’ve fished here all our lives and have never seen anything like this”. So what exactly is causing these deformities and ailments? According to sources within the article, two chemicals are likely to blame. First, is a class of organic molecules that was released in large volume along with the crude oil, Polycyclic Aromatic Hydrocarbons or PAHs. 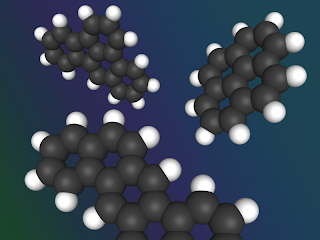 Of the PAHs, the majority of which that was found released into the environment was the simplest molecule, Naphthalene. Second, is a substance found in the chemical concoction of the dispersant COREXIT 9500 called 2-butoxyethanol, the chemical formula of which is C6H14O2. The article went into practically no detail about the chemistry or structure of the compounds, so I decided to delve further into the matter. I vaguely remembered learning about Polycyclic Aromatic Hydrocarbons (PAHs) in my organic chemistry course, so I took to the web to refresh my memory. I was quickly reminded that PAHs are a class of organic molecules that contain fused aromatic rings and do not contain heteroatoms or any substituents. The compounds tend to be hydrophobic, and dissolve much easier in oil than water. The simplest of the PAHs is a compound called Naphthalene, C10H8, which is the main ingredient in a common household product, mothballs. The aromatic rings of Naphthalene can undergo electrophilic aromatic substitution. Along with Naphthalene however, PAHs actually can range from the simple two-ring structure to fairly large, complex multi-ring structures. Several PAHs are known to be carcinogenic, mutagenic and teratogenic, and several studies were referenced that experimentally showed that cancer, reproductive failure, and lower child IQ is associated with chronic exposure. It turns out that I actually worked with Naphthalene this semester in my organic chemistry lab, in which we recrystallized the compound to separate out soluble impurities. Currently being in an organic chemistry lab, I’ve grown accustomed to initially checking the Material Safety Data Sheet (MSDS) of any chemical that I am unfamiliar with, and after doing so for Naphthalene, I quickly discovered that there are indeed many warnings associated with the compound. Such warnings include the fact that it is very toxic to aquatic life and that it is carcinogenic. Unlike PAHs though, I had never learned or heard anything about 2-butoxyethanol previous to reading the Aljazeera article, so I took to the web to find out more. It seemed that 2-butoxyethanol came under scrutiny and was studied intently following the 1989 Exxon Valdez oil spill when it was widely used along with a similar but more toxic form of chemical dispersant used for the BP oil spill, COREXIT 9850. According to the National Toxicology Program’s study of 2-butoxyethanol however, it is simply an organic solvent that is widely used in household products that seems to break down fairly easily within the environment. It has also not been shown to bioaccumulate in any plants or animals, which is good. This information conflicted with the testimonial found within the Aljazeera report that claimed 2-butoxyethanol was responsible for several health maladies experienced by the clean-up workers of the Exxon Valdez oil spill. One should keep in mind that the use of 2-butoxyethanol and COREXIT 9500 by BP was not to purposely try to harm the environment or the clean-up workers, they were simply responding to help alleviate the situation as they saw fit. However, one cannot discount the possibility that regardless of their intentions, their action of dispersing the oil throughout the water column may have caused more harm then good. By dispersing the crude oil that was flowing from the well throughout the water column. 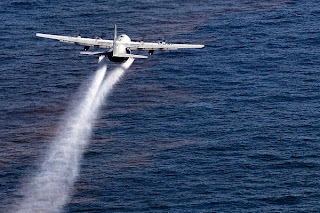 The risk that the crude oil, in conjunction with the dispersant, could indeed be more toxic than the crude oil alone is a possibility that cannot be discounted. 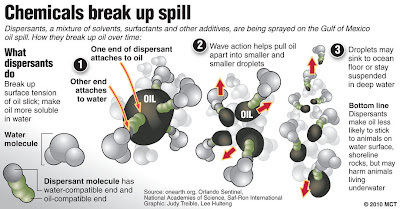 Although there is less oil floating on the surface and landing on the shores of the beaches, the oil is now dispersed in tiny droplet form throughout a much larger area underneath the surface of the gulf. Scientists have found huge “oil plumes” which stretch for miles beneath the water that are not showing significant signs of breaking down. So again, back to the question, why are there multiple reports of seafood being caught with mutations and deformities that have never been seen before? It seems to be without question why; hundreds of millions of gallons of toxic carcinogens and mutagens have been exposed to the environment that is now accumulating in plumes throughout the water column. The species that normally inhabit the area have now been chronically exposed to the chemicals for nearly two years, and we are now simply just beginning to see the effects that the pollution is having on them. An alarming observation brought about by scientists in the article is about the eyeless shrimp that are being caught throughout the affected area. Although the first generation of shrimp seem unaffected, the second generation (which were exposed to the environmental toxins during development) are giving birth to a third generation that is displaying clear signs of genetic mutation; they are born without eyes or eye sockets. This disturbing observation raises yet more questions that remain unanswered. How will other species react to these toxins? Do the affected species pose significant health risks for humans? 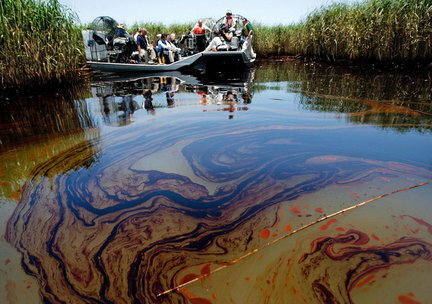 How long will the gulf experience the side affects of the BP oil spill? 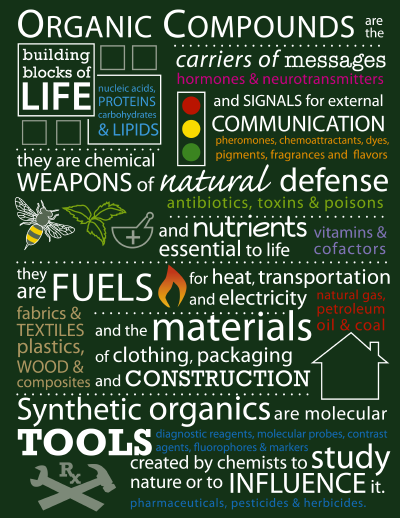 Is it possible that these chemicals will exhibit the same affects for humans, posing risk to our future posterity? While much of these questions will remain unanswered for years to come, it is clear that a great deal of effort will need to be made in order to ensure the possible risks are well understood. 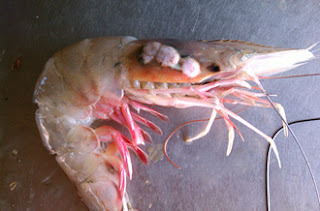 As for the seafood industry, it is apparent that the BP oil spill is already taking its toll on the native species, and the presence of eyeless shrimp is simply a waving red flag that we should be ever more vigilant in the following years to ensure the quality and safety of the seafood that originates from the gulf. I thoroughly enjoyed reading this article. It is so true that as time goes by major events are thought of less and even forgotten. I put the Louisiana oil spill far out of my mind and haven't even thought about the repercussions that are still effecting the wildlife today. I wanted to do a little more research after reading this post to see if any other wildlife has been effected and I found that there are many other species that are still paying for this accident. There are many fish that have lesions, growths, and other deformities such as no flaps that are over their gills. Dolphins are said to have very poor health conditions and are dying much earlier in life. Its so sad that the marine life is paying for our mistake. Great post! Your paper reads very well and is very informative! I too am a HUGE seafood lover and am very disturbed by the thought of eyeless shrimp! Its scary to think about how great an impact the oil spill has had not only on the people in the area, but on all the wildlife and the environment. And I guess it's pretty true what you said about the "out of sight out of mind" mentality. The BP spill is still affecting countless living beings and it's pretty scary. Thanks for the interesting read!